Philippines Travel Advisory | How to Get to the Philippines | Go Baguio! If you are coming from another country, to get to Baguio City, we must first get you to the Philippines of course. So here is the page devoted to Philippines travel in general, and Baguio City in particular. The Ninoy International Airport in Manila is the main hub for air travel to the Philippines, where 30 major airlines go to and from other countries in the world. It is also where Philippine Airlines (PAL), Asia's First Airline and the country's flag carrier operates from. Union, which is just about one hour away from here passing through Naguilian Road (Quirino Highway), where a new international airport is set to operate. Other local carriers operating in the Philippines are Cebu Pacific, Air Philippines, South East Asian Airlines, Laoag International Airlines, Asian Spirit Airlines, and Pacific Airways. How to get back to Manila from Baguio City NEW! 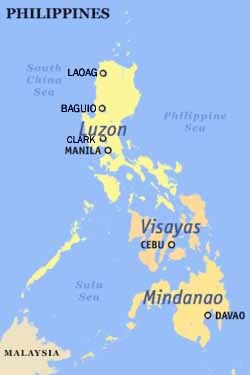 The Philippines has three international airports on Luzon island, where Baguio is located. And as mentioned above, the best one to land in to get to Baguio City, is the Ninoy Aquino International Airport (NAIA) in Manila. Closer to here than Manila is the Diosdado Macapagal International Airport (DMIA) at the former Clark Air Base in Pampanga. Philippines Embassies and Philippines Consulates are the first ports of call for information on visas, passports, business, trade and foreign investment within the Philippines. Since visa requirements vary for country to country, it would be best to access the official website of the Philippines for more information. However, currently there are more buses that will get you to the City of Pines from Manila than Pampanga. There are more car rental companies based in Manila also. Laoag International Airport in Ilocos Norte services regular flights from Taiwan and Macau. To get to Baguio, there are regular bus trips from Laoag that take about six hours to get here. The Mactan International Airport (MIA) in Cebu handles regular flights from Japan, Singapore, and Australia as well as chartered flights from Hong Kong, the United States, and other major world capitals. Davao International Airport handles regular flights from Indonesia and Singapore. So, to get to Baguio from Cebu (Visayas) and Davao (Mindanao), one would still have to take connecting flights to Manila to get here.